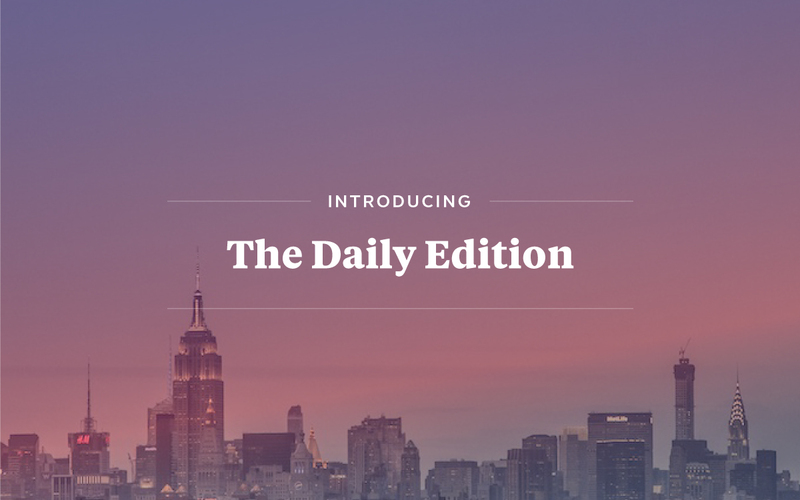 The Daily Edition is a new essential for Flipboard readers who want a fast, definitive roundup of the day’s news—with a little bit of fun thrown in the mix. Although it’s packed with information, it’s also a quick read. There are top stories in news, business, technology, sports and popular culture, and every day we go deep on one story, selecting thoughtful articles about that story as well as a beautiful cover image. The Daily Edition also features noteworthy opinion pieces, exclusive photo galleries and a rotating special section: On Monday it’s “Big Ideas,” the latest in science, health and innovation; on Tuesday we’ve got top culture picks in books, music, art and more; on Wednesday it’s all things politics; Thursday is your style update; and Friday previews what’s coming up over the weekend. We finish it all off with a song we love and a Parting GIF to send you off with a smile. You can also remove it from your tiles at any time by holding your finger on the tile and tapping the “x”—though we hope you’ll find it to be a truly useful and indispensable part of your Flipboard experience. The Daily Edition also comes in local versions for readers in the UK, India, Brazil, Latin America and Spanish-speaking U.S.